At a recent conference on the Internet of Things hosted by Digital Jersey, a glance around the room suggested about 75% of the audience was male. Women were dotted around the auditorium, generally one per table, with a few clusters of all-female tables, while out of 12 speakers, just one was female. The event, which was open to the public and free to attend, was not marketed in any way that might exclude women, and the topics – essentially how business and society might develop in the future thanks to the Internet of Things, should have been as relevant and appealing to women as to men. However, as most people attending the conference worked in tech or have roles where developments in tech are particularly relevant, the make up of this sort of event is possibly more representative of the industry than we might initially think. In the UK women make up just 17% of people working in tech compared to 25% in the US, where it has dropped from 36% in 1991. With girls making up less than 10% of those taking science A levels in the UK, the proportion of women working in tech is unlikely to rise significantly by itself. We might worry about recruitment in Jersey, but the British Chamber of Commerce indicates 52% of digital businesses are having problems filling technical vacancies, and the UK Government predicts there will be a gap of over 2 million jobs in digital skills by 2020, costing the economy £63 billion in lost income. 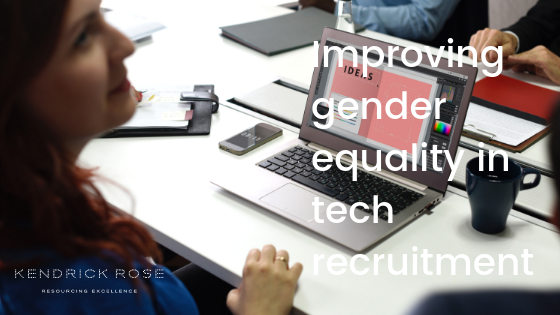 Shelley Kendrick, Managing Director, Kendrick Rose, said: “Many firms say they wish to recruit more women at senior levels, but in tech, recruiting women is an issue at all levels. Tech is a massive area of growth which Jersey should be poised to capitalise on, but firms are struggling to find the talent. Here are five things to consider if you’re aiming to grow the female tech talent in your firm. The language used in adverts could be a barrier to women working in tech. Companies such as Vodafone now scan job adverts to correct gender bias, turning words like ‘aggressive’ to ‘bold’ and ‘outstanding’ to ‘exceptional’ to encourage more women to apply for jobs. And it appears to be working. During a three-month trial the number of women recruited increased by 7%. Artificial Intelligence is increasingly having a role to play helping recruit more female candidates. Language analysis tools such as Textio screen job ads for bias, highlighting words that might put certain genders off, suggesting suitable alternatives. Johnson & Johnson reported a 9% increase in female candidates after using this tool, while Atlassian, a business software firm, boosted its share of female new graduate hires in engineering, product management and design, from 10% to 57% in two years. According to ISACA’s Women in Tech Survey 2017, the biggest barriers experienced by women in tech were lack of mentors (48%) and lack of female role models in the field (42%). These were followed by gender bias in the workplace (39%), unequal growth opportunities compared to men (36%), and unequal pay for the same skills (35%). Research by Harvey Nash found just 7% of CIOs (Chief Information Officers) around the world were women (2014). The same study found 29% of CIOs do not believe women are underrepresented in tech. Highlighting the career progress of successful women in tech firms could be one way to help address this issue at the recruitment stage, while finding ways to network with other women in the profession, and for firms to encourage women in senior positions to mentor junior employees, could be another boost. Initiatives such as Lean In, founded by Facebook’s Chief Operating Office, Sheryl Sandberg, aim to put women in similar fields in touch so they can learn from each other, network, and mentor people entering their profession. Although this is open to all professionals, tech firms can clearly get more involved through sponsorship or by encouraging employees to speak at events. While many countries, Jersey included, have legal provision for employees to request flexible working hours, most people still work 9-5 for five days a week. In the ISACA Survey 14% of respondents say women are underrepresented in tech because there is a lack of work-life balance. Creating an environment where it’s acceptable to work flexible hours, part-time hours, work from different locations, or to do a job share, make it easier for women to stay in roles and continue progressing careers alongside family commitments. True flexible working is also a sign that a company is progressive, and for tech firms, or indeed any firm that wishes to be more innovative, giving employees the ability to choose hours and locations could be a win-win for getting the best from employees and retaining and attracting talent. Stipulating that shortlists for roles must include a higher proportion of women might mean you will interview more women, but you will only attract more women of the right calibre if the roles are attractive to start with. Women in tech are ambitious. According to the Centre for Talent Innovation, 76% of women in science, engineering and technology roles consider themselves ‘very ambitious’, while 70% are keen to be promoted to the next level. Consider the sort of qualities and skills you are looking for in roles and question whether these are the sort you are likely to find in women who might apply. If you are serious about attracting more women, perhaps it’s worth shifting the focus of the role, creating a balance of opportunities for growth and career progression to make the role more appealing. Female candidates are more likely to find a collaborative culture more appealing than an overtly competitive one. A study by the National Centre for Women and Information Technology (NCWIT) shows the quit rate for women in tech is double that of men, at 41% compared to 17%. 80% of women in science, engineering and technology professions report ‘loving their work’ yet 56% leave their organisation at the mid-point level (10-20 years into their careers). Only 20% of the women who left exited the workforce, suggesting they looked for other roles, rather than leaving because of family or personal reasons. In an era where good talent interviews the employer as much as the other way around, salary alone is not enough to make up for a working environment where people don’t feel comfortable. Empowering employees by ensuring everyone’s views and input matters, makes people feel valued. An open environment, where people are not frightened to speak out, helps make people feel like part of a winning team others want to join and stay involved with. Are you interested in opportunities in tech in Jersey? Get in touch with Shelley or Lauren at Kendrick Rose to find out about new jobs in the Island or check out the Kendrick Rose Jobs page for other exciting professional roles. Kendrick Rose is an executive recruitment firm based in Jersey specialising in mid to senior level roles across Finance, Professional Services, Technology, Legal and other sectors at the forefront of the Channel Island economy.